Branding is one of my all time favorite topics. If you are new to the show (in which case, welcome) you may not know that I have an extensive background in this area. I obtained my undergraduate degree in marketing before working at an advertising agency, then started a credit union marketing consultancy and then ran a marketing department at a financial institution for 6 years. While there, I led a brand refresh that nearly tripled awareness in less than two years. 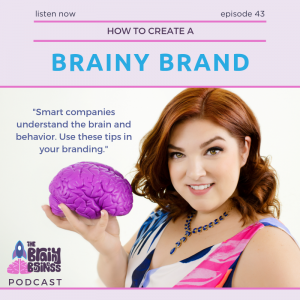 This background in branding and marketing has led to the way I implement behavioral economics for my clients and here on the podcast. Recently, I have received a lot of questions about branding – what matters, what is included, and how behavioral economics ties into that…and that’s what we’ll dig into today. [04:55] A brand is “a type of product made by a particular company under a particular name” or the way ranchers mark their cattle. [05:31] You put your stamp on something to show it is yours (and many people wear those same brands with pride to show they are part of the herd). [05:52] People pay more for brand name items and they even get more value out of them because of expectations and conditioning. [06:56] Marketing and branding are not the same thing. Marketing is all the one-off stuff you do to get your name out there – radio ads, website work, flyers, brochures, and sponsorships. Marketing is reactive. It isn’t building something bigger. [07:49] When you create a brand, you have a strategic center everything can relate back to – a touchstone for your company. Any opportunity or new request can be brought back to this foundation to see if it is in alignment. [08:53] Marketing research has long struggled to be considered true research in the same way the sciences are. [09:07] A brainy brand knows what it is trying to achieve and builds quantitative and qualitative research projects to test, learn and grow. [11:19] Examples from Jonah Berger’s amazing book Contagious. Such as people wanting Mars bars after hearing about the Mars Rover and being more likely to choose Sprite after writing with a green pen. [13:13] The concept of priming was used when shoppers were shown pictures of dogs that helped prime them to choose Puma shoes. [13:23] Think about the messaging that’s coming right before your advertisement. It’s important to think about the context of your ads. Priming is really relevant. Make sure that you are associating your brand properly with the right things. [15:47] When creating the brainy brand it was important to me to choose things that were fun but intelligent to draw people in. It’s my responsibility to make sure that the messaging is consistent. [16:27] It’s important to be strategic and thoughtful about what it is that you are doing for your company. [17:35] There is cookie dough next to the milk, because simple associations win the day. The product is placed where it is more likely to trigger the buyer’s brain. [19:01] Availability is the weight our brains place on one thing based on how easy the item comes to mind. [20:02] A brainy brand knows that everything matters. This is why I truly believe behavioral economics is the future of marketing and branding. [20:18] When you understand how the brain works and all the bazaar ways it makes decisions, it unlocks a powerful space where you can see what a certain word choice or ad placement could do that another would not. [21:12] Brands have personalities just like people…and for good reason. Known personalities create expectation in our brains. [22:18] When you expect someone to act one way and they act completely differently…like their personality has been surgically replaced with that of their opposite…it is unnerving. [22:52] There is always another competitor, a new medium to look into, a new product entering the market. [23:36] A truly brainy brand, one that is laying the foundation of their messaging and who knows who they are and how they would respond…who has a brand personality so well known that it is like a real person…they can react properly to change – and create some of it themselves. [25:32] Method acting is a lot like business branding because they both require a lot of preparation and understanding of things that may never be brought up. [26:39] The best brands – brainy brands – know everything about who their brand is as if it were a person. [27:17] When brands have great personalities, it ties into the associations people have about them. [28:54] Brainy brands need to have everyone on board, rowing the boat in the right direction. [30:03] Behavioral economics and other studies of the brain look into why people do the things they do, and how to use that insight to predict what they might do in the future. I’m so excited to be a part of it. 44. Rebrand, Refresh or Reinforce?